Taking macro shots of little critters is amazing and opens a door to a new weird kingdom. 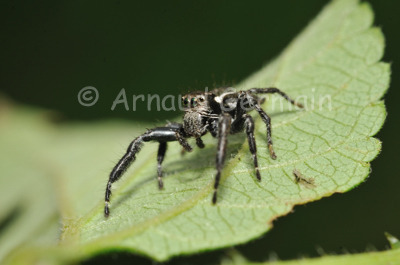 This little jumping spider (about 1cm long) was in our bedroom. I carefully put it on a leaf and released it outside. I could not resist taking a few pictures. As they hunt mainly using their sight, these particular spiders have massive eyes. I was amazed at the green sheen reflecting in the eyes of this one. Depth of field is always a challenge when taking macro shots, so I went to F18 to try and get the whole spider sharp. Nikon D700, Nikon 85mm macro VR, F18, 1/60s, ISO 100, handheld.